We got a bit of a cold snap today with temps around the 50’s. Jackets were called for to block the chilly winds. A warm bowl of soup was the next order of the day so I conjured up something warm and creamy and comforting; creamy corn chowder. 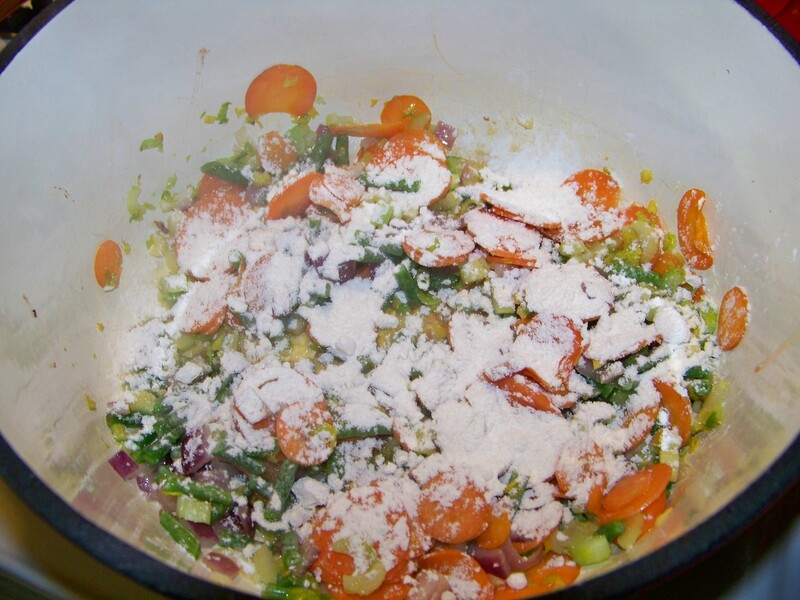 This looks like a lot of ingredients, but half are seared vegetables and half are the liquids and spices (I combined the spices and cornstarch into a bowl to add it all at once). You add them in that way, preparing the vegetables in the pot with the oil on high heat, just searing the edges about three minutes. Add the potatoes along with the seasoning mixture, stir it all in for a few seconds to let the herbs bloom a bit and the corn starch stick to the vegetables. Right away add the water and stir until the bottom of the pan cleans up a bit from the seared vegetables and spice mixture. Let those caramelized flavors brew into the water, add the other liquids, and let everything simmer together for about 30 minutes. All the individual ingredients add their own special pizzaz. 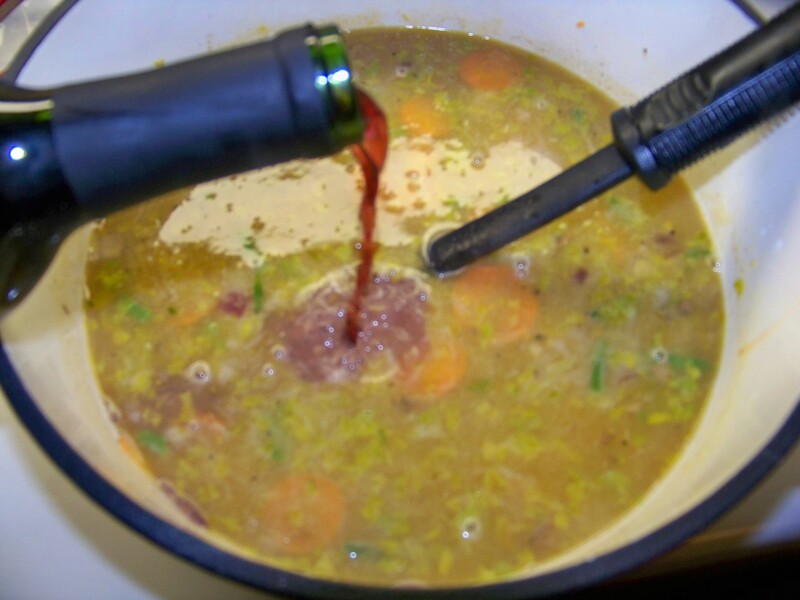 Let the pot of soup cool for about ten minutes before serving and get ready for a mouthful! With everything cut in tiny pieces in the beginning, everything in the end is sufficiently intermingled with everything else. The result is so much flavor throughout each bite and each bowl you won’t believe it! Warm, rich, savory, sweet, bright, satisfying and delicious; this soup’s got it all. A while back Mr. Delicious and I bought a portion of a grass fed cow. We have a freezer full of a nice variety of meat now…some of the best meat I’ve ever tasted. Even the cheaper cuts turn out to be something special. 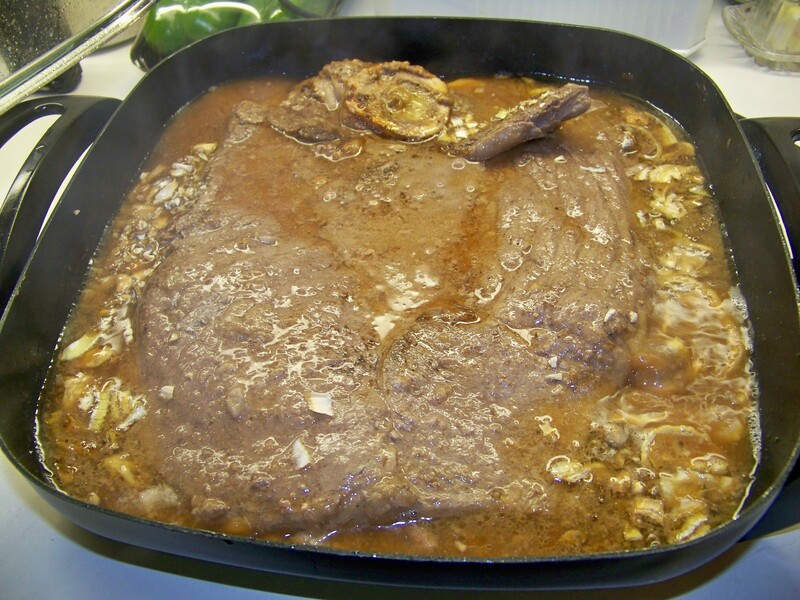 I’ve already posted a recipe for Swiss Steak made with the round. It was so good I had to make another one. I did it the usual way, pounding and pricking, salting and searing, adding flour then liquid, then onions and mushrooms and letting it braise for hours in the electric skillet. Being a rather large piece of meat there was plenty left over. You could never overcook round steak. Cooking it only makes it more tender and that’s what makes it the perfect meat for a hearty soup. I began by cutting up the remaining steak into tiny cubes. The gravy made by braising the steak really offered tons of good flavor so I made sure to reserve a bit of it to add as well. 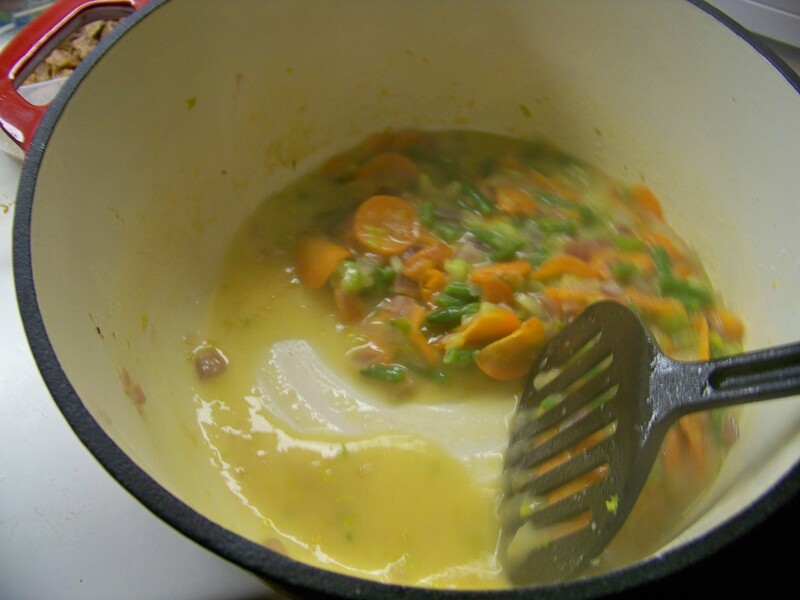 In a heavy enameled pot, I sauteed the usual vegetables…carrots, celery, and onion. Frozen green beans cut in small segments were also added. I want this soup to have good body so I sprinkled about three tablespoons of flour over the vegetables, stirred it all in and let it cook a minute or so to form a brown layer on the bottom of the pan. A few more seconds and this brown layer could turn to a burnt layer so I quickly poured in some water to capture this perfect stage of golden brown and prevent it from going over the edge. The water soon began to blend everything together and thicken. I added the rest of the water, totaling two quarts then added the meat and remaining gravy with all of its sumptuous flavor. At this point some final seasoning needed to go in the mix. Red wine added a deeper color as well as deeper flavor so about a quarter of a cup went in. As the soup began to boil, two teaspoons of salt and a teaspoon of pepper didn’t hurt. Finally, to give it a hit of zippy tang I added about three tablespoons of A-1 sauce (I would never put this on a steak but I love how the stuff adds brightness to sauces and soups like this). 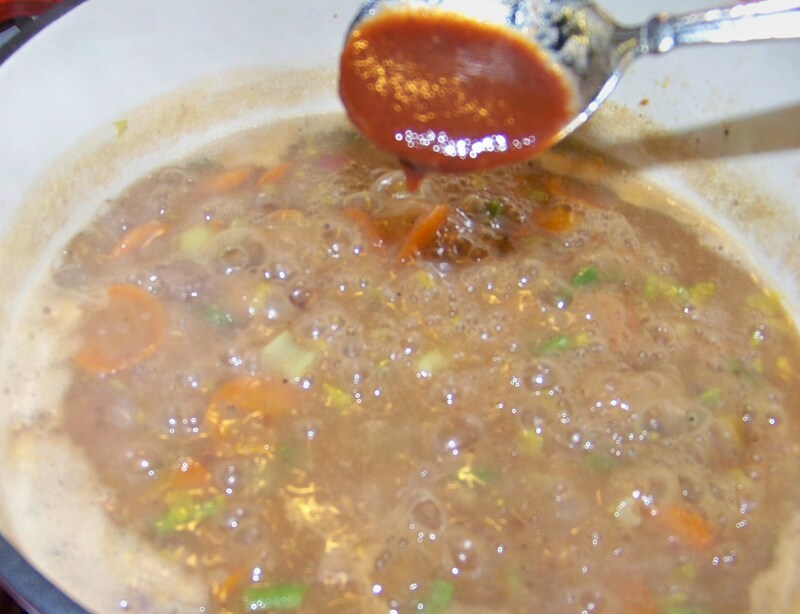 All that this soup needed now was to simmer and let its variety of colors and flavors blend and become a very special tasting soup. 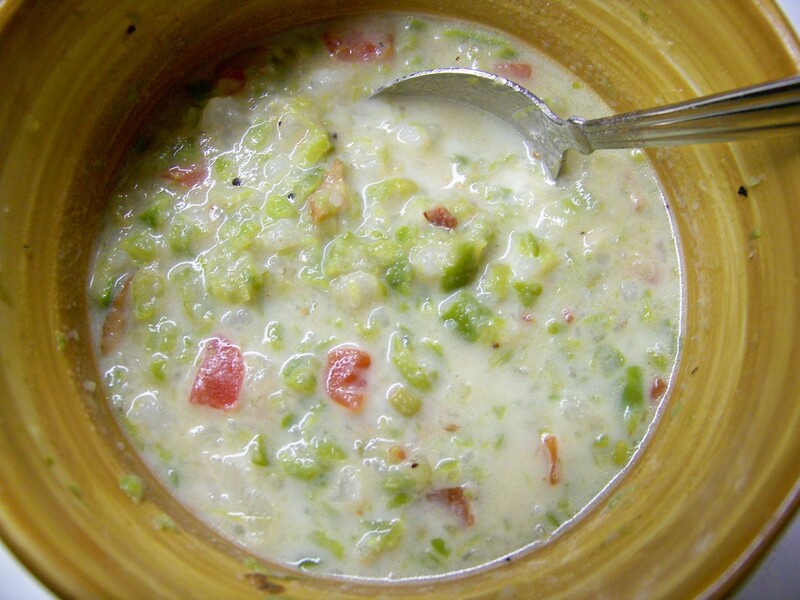 In the wintertime in St. Louis (or really anywhere) enjoying a soup like this is a perfect way to stay happy and warm. As I have posted before, dehydrating is a great way to store food. When you dehydrate, you only take out the water…all of the flavor and most of the nutrients stay in the food. This week there was a great sale on green peppers, onions, and mushrooms. These are things that I use a lot in my cooking…especially in cooking stews and soups. 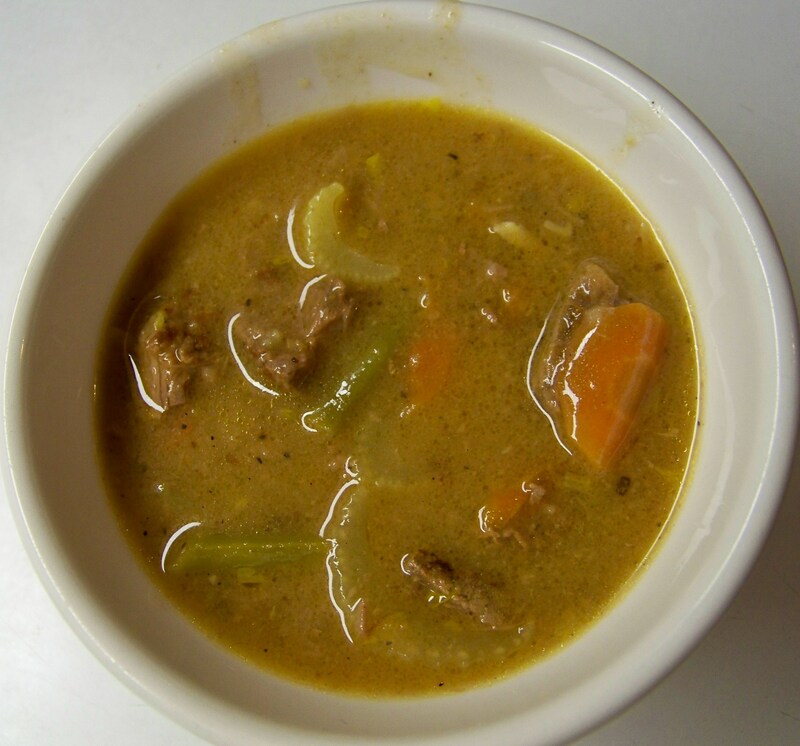 Stews and soups are the foods that are really easy to make, and great to prepare when the weather is not the best. In the summertime I hope to have food from the garden on hand that won’t need cooking. Even so, the surplus from the garden with all its fresh flavors can be dried and stored as well. We have a snow storm coming our way just now and besides stocking up last week, we have dehydrated several bags and trays of mushrooms, onions and green peppers to use another day. Dehydrated foods last far beyond the shelf life of regular canned items, decades beyond even. To do this we have sterilized mason jars with lids, and a special attachment that hooks to our Food Saver vacuum bagging system. It cost about 25 dollars but is worth a lot more because we can seal up food that we purchase on sale that ten years from now will be maybe ten times the price. The mushrooms we dehydrated cost us 69 cents per container, and the onions were on sale for 79 cents per bag (7 medium onions in each). We use a lot of onions so roughly a dime an onion is a great deal. Having them ten years from now because we dehydrated and stored them at that price seems even better. So you might see that purchasing vegetables and even some meat when there is a really good sale makes for some super savings in the future. It also takes up so much less space storing these foods when you take out the water. We love to store food this way and store lots of vegetables from the garden this way, food on sale from the store, and food that our relatives have hunted and shared like deer meat. I’ve posted on how to dry deer meat and beef before, also how to store vegetables like broccoli, tomatoes, potatoes, carrots, corn, apples, also herbs like parsley, cilantro, and basil. 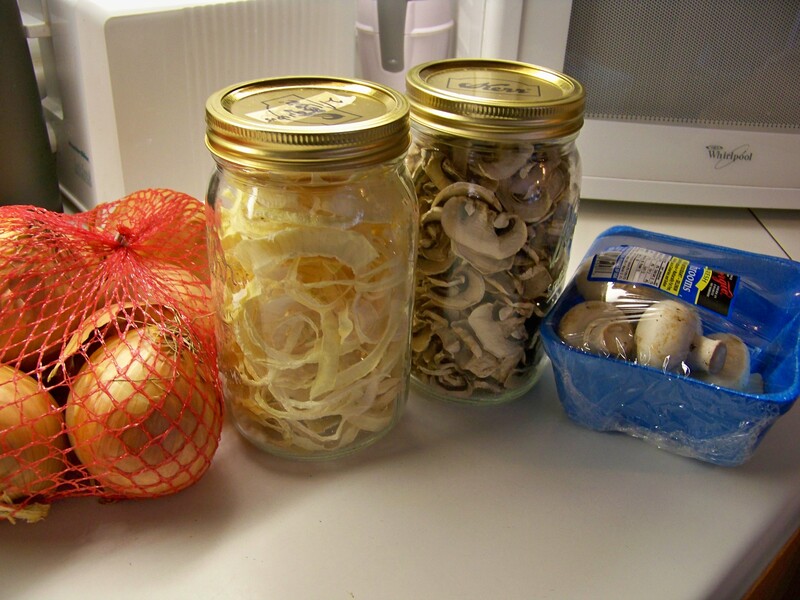 In this photo you will see four containers of mushrooms in one Mason jar, also a bag of onions in one jar as well. You could fit at least three pounds of dehydrated meat in one jar, and a whole two bags of frozen broccoli in one as well. 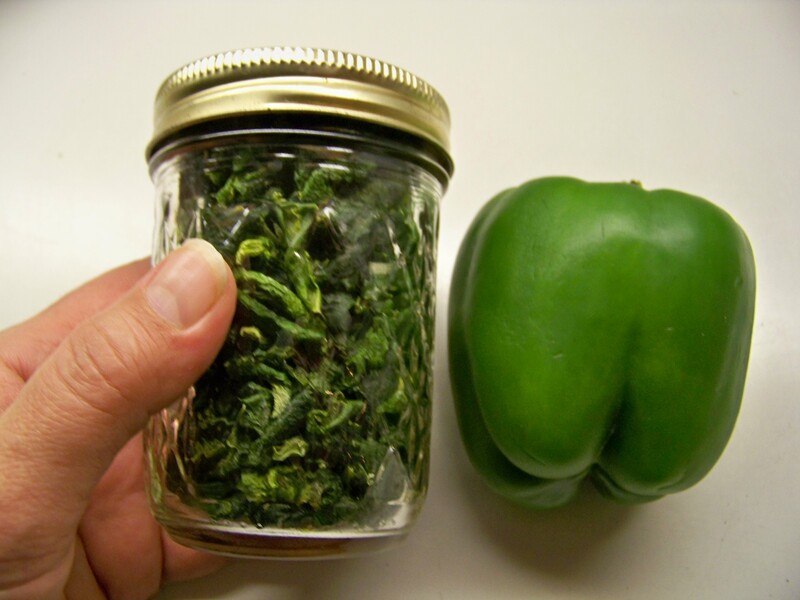 Ten green peppers chopped and with the stems and pith removed can fit into an 8 oz jar…yes, this is ten chopped green peppers we can preserve up to 25 years! At any time we might toss a portion of these jars into a soup or stew and enjoy all the flavor it had on the day we dried it. People all over the world have been doing this for thousands of years! If you ever try to dehydrate apples, good luck getting them in storage. They are so delicious that we can hardly help ourselves from eating the whole batch. I think that they are the best treat of all from the dehydrator. A close second is corn and the tomatoes are third I think. Corn makes a great crunchy snack and tomatoes are great when baked into bread and bagels. We’ll have a tons of snack food some day if stores can’t provide fresh veggies for what ever reason…snow storm, power outage, or the proverbial “Zombie Apocalypse” . We’ll be OK by having prepared just a little beforehand. Anyone can do this if they put their mind to it. You don’t have to go to a soup kitchen for free soup…at least I didn’t have to today. I just went to my trusty old refrigerator and cleaned out the leftovers. In there I found all the ingredients in the title of this entry, added a few spices like minced garlic, onion powder, freshly ground black pepper, and a pinch of salt. The green beans were already cooked with onions and bacon which seasoned them nicely. The potatoes were left over boiled and peeled russets, and the tomatoes were from a partially used can of Ro-tel tomatoes with green chilies… plenty of heat and flavor there. I added a splash each of cream and milk , mashed it all together with the potato masher, heated it in the microwave, and this lovely and delicious soup was the result. Just what is needed on this cool day. This year is winding up in a tough way with snow and sickness all around. Seems like everyone I talk to lately has some affliction. It is true in our house too. A nasty cold, cough, sniffley thing is going around. I’m doing well but trying hard to stay out of everyone’s germy way, so that means I’m in the kitchen a lot with my nose over a nice pot of steamy something or other. Today with already an inch and a half of snow on the ground and a husband to cure up before a long midnight shift, I made a stew with some things from the fridge and pantry. The first thing I did was heat the oil, dice up the vegetables and sausage, and toss them in a big stock pot. I let the onions get clear then added the spices and cilantro. I let that saute a bit then add the water and wild rice package along with the seasoning packet that comes with it. I put the lid on, put the flame on simmer and let that go about 25 minutes or until the rice absorbed the liquid. 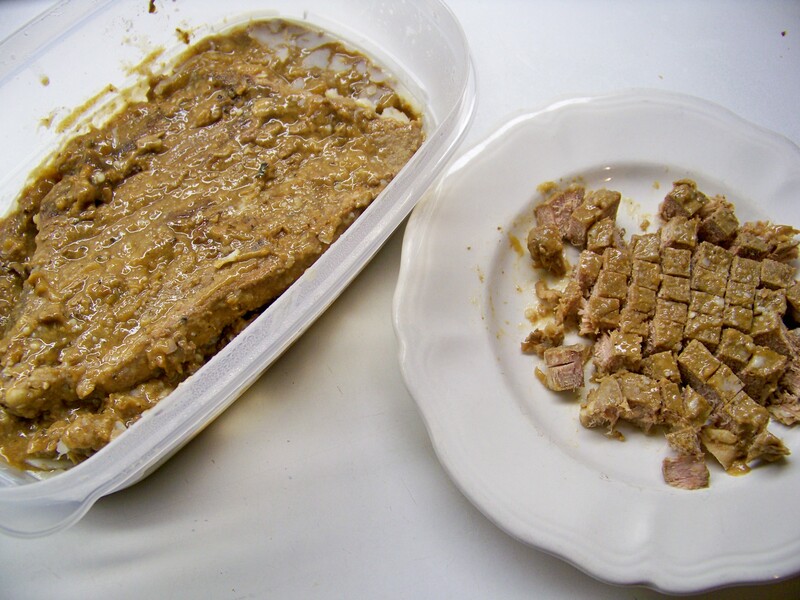 The swai fillets were chopped into 1/2 in chunks and tossed in. A good rolling boil was achieved just until the swai was cooked through and all white. This only took about three minutes. I turned down the flame again and added the vegetable stock and tomatoes. This was now let to simmer a few more minutes. It all came together and was a nice seafood gumbo type soup…warm and soothing. The spice was just enough to open sinuses but not cause a sore throat to become more sore. It was just what the doctor diva ordered this cold snowy day.